We are a full Septic Service company - meaning we do much more than just pump out septic tanks. 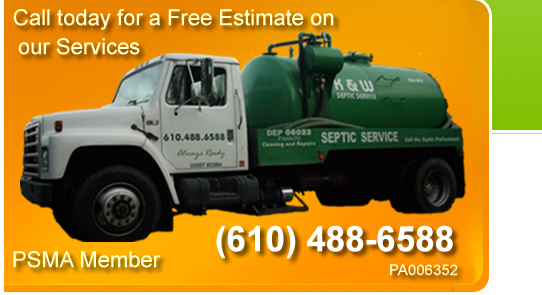 Here are more of our Septic Services. If you are not sure where your tank is located, we will help you find it. the most competitive rates in Berks County and free estimates. K and W Septic Service is a proud member of the PSMA - the Pennsylvania Septage Management Association, and we take great pride in the environment we live in here in Berks County Pa. We believe that Conservation, and Management is extremely important in the septic business so we take great care to ensure our environment is protected.